One minute to the anthem and puffy cotton balls loitered viciously in the firmament, not a hint of rainy disaster in sight on the grid, tragically enough. Although the wind at track level was whipping about viciously, suggesting that perhaps the weather was less stable than it looked at first glance. With the thermometer headed back towards Friday's temperatures, tyre degradation and blistering were back in the window of discussion, with left rears in particular having taken a beating in Friday's sessions. As with basically every race this year, a one stop was in the cards, with the only question being the lap and compound taken on. Early would be 19-22 and taking on Mediums, but if pace is good, could be lap 26-28 and then the Softs. Into the second lap they went, evenly spaced at a second apart at the front as Raikkonen already reported some rain in the visor, confirmed as Turn 6 on team radio. Hamilton had easily regained the spot he gave up to Ocon into T1 and kept up the attack, by Alonso into T8, though it was more of a gentleman's maneuver as Alonso was very well aware that his battle was not with Lewis on the day. Warnings on rear tyres already on the radio as Leclerc was the next victim of Hamilton's advance, again into T6 on the following lap, putting Lewis into the points on lap 4. Sainz was next up the road, half a second ahead and into T6 he went down to the Mercedes. Behind, Ricciardo continued his advance up to P15, as Lewis was already onto the back of Grosjean, who had been taken by Perez half a lap before into T6 after a self-inflicted lock up. T6 and it was done, Perez ahead and just on the edge of Vettel's pit window. Lewis had dispatched Perez on lap 9, meanwhile, and was easily by Hulkenberg as well a couple of laps later, as the threat of rain hung menacingly over the circuit. This looked to work to Mercedes' advantage, as it would encourage the leaders to run long so as not to have an extra stop in case the rain arrived. But the flip side to covering that possiblity was losing time to the longer lasting Softs on Hamilton's car. Lap 15 and Kimi was in for Softs, and out just ahead of Lewis. Way too early for a one stop it would seem, meaning Ferrari was using Raikkonen to slow Hamilton's advance, as Lewis had easily jumped Magnussen on the previous lap and was now into free air and clawing back time from the leaders. Essentially, it looked to be a defensive manuever to keep Lewis out of Vettel's pit window. In the interim, Alonso entirely missed T1 on lap 16 allowing Leclerc easily through and up into P11, an unusual mistake from the McLaren driver. Further back, Ricciardo continued his slow plod through the field, and had made it up to P12, Leclerc firmly in the Aussie's sights. Raikkonen continued to chunk time out of both Hamilton and Bottas, who was starting to slide backwards as his Ultras began to lose performance. But he was running around the same time as Vettel and suddenly, it was Raikkonen and Hamilton, running about seven tenths faster a lap on the 3 leaders. Remarkably, Hamilton had done quite the job of managing his tyres, and he was into the 1:17s on lap 22, faster than Kimi and potentially with one less stop to make. Still out of Vettel's window, but just barely, now 22 seconds back of the Ferrari. On lap 21, meanwhile, Kmag's stop had gone a bit sideways as he came out between Ocon and Ericsson, on the Mediums, 1 stop all the way. Two laps later and it was Perez' turn for it all to go wrong. In for a stop that went horribly long with a sticky wheel nut. That put him out behind Grosjean, whom he had already spent a goodly chunk of time passing, and Grosjean was not going to make it any easier for him the second time. Ericsson got Ocon and Hulkenberg got them both. Stroll was causing mayhem, meanwhile, on a long run and just creating huge problems for the lapping traffic as he was moving so slow. Lap 26 and Ferrari pulled the plug, Vettel in for a set of Softs, out just ahead of Hamilton, a 4 second interval between them and Raikkonen now ahead of the championship leader.. Bottas the loser in this scenario, as his stop looked to put him out behind Lewis, who would be going longer since he started the race on a harder tyre compound. Also because he didn't have the pace on his old Ultras, and every lap he stayed out cost him time to Vettel and that precious, precious top spot on the podium. Two laps later, and it was Vettel getting increasingly urgent as Ferrari dithered about whether to let Sebastian through. Presumably, either Raikkonen had been switched to a one stop, or they wanted to hold him out until the rain arrived. But indeciseveness reigned on the pitwall and lap 38 saw Vettel pointing out to the team his tyre temps were going through the roof and he was losing all the gains of his first stint quite rapidly. One lap later, the call was made, and in couched language, Raikkonen was asked to let Vettel through. Kimi's reply, succinct as ever, was "what do you want me to do, just tell me". And so they did, and thus Kimi let Vettel by. Immediately, Vettel was half a second faster than both Hamilton and Raikkonen, and the threat of rain, as ever, ws just 10 minutes away. Bottas T6 on Raikkonen as the Finn was squeezed by Magnussen, giving Bottas the space to get by. With the track turning to ice, both hove into Hamilton's view as Perez spun off track, with lap times up into the 1:30s as conditions worsened. Raikkonen was in the following lap to grab a set of Ultras, putting him behind the pair of Mercedes as the remnants (ok, to be fair, the car was basically intact, but artistic license) of Vettel's car were cleared and the Safety Car stayed out. Hamilton, Bottas, Raikkonen, Verstappen and Hulkenberg ran in the top 5, with Hulkenberg on a set of Inters. Lap 55 and the lapped runners were sent forward as Hamilton asked for the SC to speed up, to help him get temps into his older Ultras. Stroll was in and looked to be done for the day as the mechanics rolled his car into his box, after Sirotkin's earlier smoking demise during the hubbub caused by Vettel's crash. Radio replay of Hamilton's call to stay out revealed the sheer insanity behind the scenes as they called him in, told him to stay out and then called him back in, before saying it would all be OK, which caused the Mercedes driver to veer in late, then dive back out across the grass as the engineers struggled to get it all sorted out in the wake of Bottas' disastrous stop. K-mag and Grosjean were in back in for dry tyres covering Hukenberg who had bailed for a set of Ultras, with HAAS being punished most for covering Renault, down to P12 and P11 respectively once the stops were factored in. Force India were the biggest midfield winners, up to P6 and P7 for Perez and Ocon, having smartly looked at the laptimes, not just their rival, and kept their drivers out on dry tyres. Safety Car in at the end of lap 57 was the call and Bottas was all over the gearbox of Hamilton as the green light beckoned. Good restart as they rocketed through T16 and T17 and onto the start/finish straight. Valterri got a great run and Hamilton closed the door hard into T6, but with fresher tyres on Bottas the battle wasn't done and and side by side they went into T8. Sainz was being investigated for overtaking under SC and suddenly it was Bottas, defending from Raikkonen, a gap to Hamilton having suddenly and a bit mysteriously sprung up. Lap 60 and it was 2.2 seconds for Lewis as he set fast lap, into the 1:15s. A radio call, from James Allison to Bottas, revealed the truth, Bottas was ordered to hold station rather than race for the win. No argument from the Finn as he no doubt understood were there roles revered the same rules would apply and he set about his team duties, keeping Raikkonen off the back of his suddenly championship-leading-on-the-road teammate. 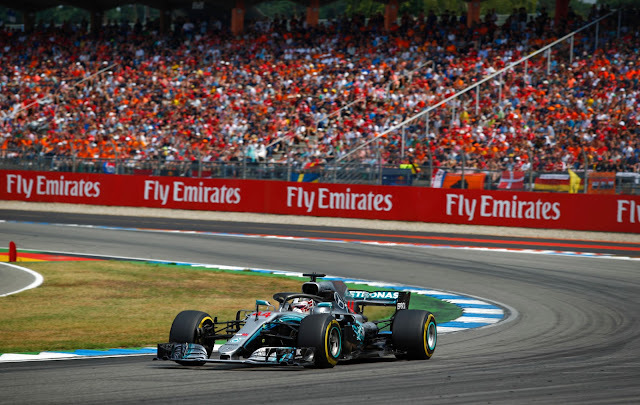 Last lap of the race, then, and again it was a fast lap for Lewis on the previous tour, and the closing laps shoot out that was very, very much anticipated as it developed behind the Safety Car was sadly shut down by Mercedes before it could get properly started. As the checquers fell, with no change at the top it was clearly the championship battle foremost on Mercedes' minds, a haul of points for the Constructors and back on top for the team and a big reversal in the Drivers as well, with Hamilton also ascending, ahead of Vettel thanks to the German's rare mistake into T13, in front of his home crowd and leading, no less. Sainz' penalty chucked Hartley into the top 10, doubling his championship points haul for the season, and Grosjean had quite a redemptive drive in the last laps for HAAS, going P6 to claw back a disaster of a strategy call, while Kmag could do no better than P11 after HAAS got it ALL wrong with the stops. Force India did their cause tremendous good, combining P7 and P8 for a well needed haul of points, by keeping their cool while all about them lost theirs. As if to drive the point home that nothing in motorsports was fair, rain hammered the post race podium celebrations, forcing interviews under umbrellas and waterfalls off the roofs in the paddock, pallets down to cross the pitlane. It will be a long 2 weeks for Vettel, left to rue not only his team's indecision with his championship on the line, but his own mistake the put paid to his lead while driving what, at the moment, looks to be the best car on the grid. Even as this report was put to bed, however, the race was still not over as Hamilton and Mercedes were summoned to the stewards to explain his pitlane driving vis the regulations, which his driving rather did appear to violate.